Modeling the Classics - copy, learn and write like the Great authors! * Models of excellent literature from Bambi,The Trumpet of the Swan, Paddington Bear, The Hobbit, The Bronze Bow, Brambly Hedge, Wind in the Willows, Charlotte's Web, Little Britches, Heidi and more. * Models of descriptive writing of a person/animal; Step by Step guide to write descriptively based on one of the models. Four other models for practice. 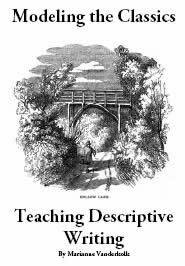 * Models of descriptive writing of a place; Step by Step guide to write descriptively based on one of these models. Four other models to be used for practice. * Models of descriptive writing of an object; Step by Step guide to write descriptively based on one of these models. Four oOther models to be used for practice. * Printable handwriting pages (various sizes to choose from) to copy the models. * Questions and Instructions based on my 10 Day Outline of Writing Lesson Plans based on Literature. * Graphic Organizers to help the writer. * The last pages of this e-book contain the information on my website about using Stylistic Elements to teach descriptive writing, followed by some graphic organizers.